The electroplating of zinc-nickel alloy assures a high protection against corrosion. The alkaline one is more diffused, but …. 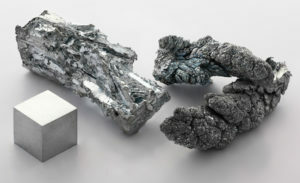 After iron, aluminium and copper, zinc is the most used metal. Today it features a widespread use as protective element, in virtue of its high resistance to corrosion, performed both as barrier effect, insulating the component from the surrounding environment, and through galvanic process. 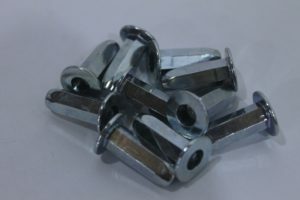 In the latter case, the piece is protected by galvanization thanks to the preferential dissolution of the zinc coating that acts then as sacrificial element with regard to the underlying metal to be protected. 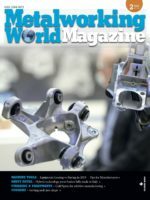 Today the automotive industry constitutes the driving engine of galvanizing processes and, in particular, we witness a strong interest in the electrolytic galvanizing with Zn-Ni alloy, able to grant a higher resistance to corrosion than the coating with Zinc only, even if the process involves higher costs mainly owing to the Nickel cost. The Zn-Ni, moreover, promotes the formation of very compact deposits that assure an optimal adhesion of the successive paint layer: also for this reason, it is widely used in the automotive industry, where the high resistance to corrosion and the adhesion of the final primer are irremissible requisites. It is worth reminding that the entire electroplating process is based on the difference of potential among the elements, thus constituting their driving engine, and that metals and alloys are ordered according to their electronegativity and therefore subdivided depending on the anodic or cathodic behaviour, with a flow of electrons, in galvanic cell, from the most anodic to the most cathodic. Concerning the Zn-Ni alloy, it is a binary law, with a Nickel percentage by 12÷15%, content that represents the optimal value for an adequate protection degree. In fact, schematizing the function of Zinc and Nickel, Zinc acts as sacrificial element, protecting the underlying metal, whereas Nickel improves the coating nobility, decreasing the corrosion current. If the Nickel percentage was too high, the deposited coating would become too noble compared to the substrate and then no longer able to be sacrificial even generating, under limit conditions, an inverse process. Generally, the coating layer thickness is 7÷15µm, thickness that allows reaching over 720h in the saline mist test, as indicated by the regulations of the automotive industry. The characteristics of the electrodeposited Zi-Ni coating are also strongly influenced by the operational conditions of the bath, first of all by pH, temperature and current, as well as by additives, which can almost be considered co-protagonists. The outstanding success concerns the formulation with the highest content of Nickel in alloy, i.e. 12-15%. The electroplating of Zn-Ni alloy can take place in acid or alkaline environment, with opportune additives, in computerized plants, both in static and barrel processes. Today the most common Zn-Ni coatings are alkaline ones, generally deemed more performing owing to presumed not exalting industrial outcomes obtained by the acid bath. 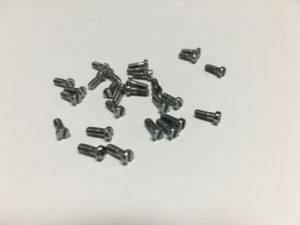 Consequently, the automotive sector, first user of these treatments, has preferred requiring only alkaline bath treatments, then laying a sort of milestone suited by other sectors too, including the bolt industry. Recently, thanks also to the technological developments, a rescue of the acid electrolyte seems in course since it grants adhering deposits, a relatively simple management that needs a low use of additives and an excellent aesthetical quality. According to recent studies, good news emerge about the hydrogen embrittlement, a problem very felt in the automotive industry and in the mechanical sector in general, which is very reduced and, in some, almost inexistent. The two plating systems mainly differ for the deposition speed and uniformity. If the deposition speed of the acid batch is about double than the alkaline bath, the alkaline bath deposition occurs uniformly and constantly on the entire surface, also in those zones so-called “critical”, even if the look is less polished and bright than the acid plating, because of the different morphology and structure of the grain. In general, the deposition is followed by treatments such as the passiv ation, the sealing and the dehydrogenation. The passivation further increases the protection of the base metal, in favour of a higher resistance to the corrosion triggering. 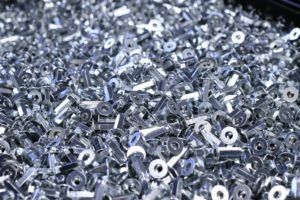 In addition to resistance, the passivation allows meeting particular decorative requirements, since it is possible to confer different colours to the manufactured good. The sealing leads to an increment of the resistance to corrosion, too, while the dehydrogenation, carried out in furnace at a temperature of 180÷200°C, with a time of permanence that depends on the thickness and on the mechanical features of the manufactured items, reduces the risk of hydrogen embrittlement, due to the development of hydrogen during the galvanic treatment. The use of additives in the electroplating of Zn-Ni alloy is a practice widely used to confer the desired characteristics of uniformity and brightness to the deposit. Actually, each additive plays a precise role inside the bath, even if they do not directly take part in the deposition reaction but they instead act influencing the deposit nucleation and growth. And, consequently, the morphology of the deposited layer, on which the physical properties and the mechanical characteristics depend. According to various studies, the use of additives in the electrodeposition bath acts on the average size of crystalline grains and on the crystallographic orientation of the deposit: the attainment of a high resistance to corrosion is accomplished through the research of the best compromise between the granulometry and the crystallographic orientation, starting from the preliminary assumption that fine grain and low porosity are index of better resistance to corrosion. With hydrogen embrittlement we mean a chemical-physical process that concerns various materials, especially metal ones. The phenomenon, interstitial, make the good fragile and subjected to premature failure due to fracture and is particularly serious for high-strength steels. The embrittlement stems from the small sizes of the atomic hydrogen that, when determinate situations occur, spreads inside the crystal lattice, deforming it and consequently inducing stresses that can lead to the formation of cracks and to the decay of mechanical properties. The hydrogen diffusion can prevailingly occur during the solidification process of the metal bath, during chemical and electrochemical processes referred to galvanization, in presence of atmospheric water vapour or from electrodes or wet flushing while welding. Coating applicable on metals like Zama, steel, (also heat-treated), cast irons, Copper alloys. Process executable both on static frame plants and on barrel systems. The use of sealants and lubricants allows increasing the resistance to corrosion, regulating the friction coefficient, improving aesthetics by conferring a uniform look to colouring.